Kirgizstan (/ˈkɨrɡɨstɑːn/ kir-gi-zstahn) (Kyrgyz: Кыргызстан, រុស្ស៊ី: Киргизстан or Кыргызстан or Киргизия) or Kyrgyzstan (/ˈkɜːɡɨstɑːn/ kur-gi-stahn), officially the Kirgiz Republic or Kyrgyz Republic is a nation located in Central Asia. Landlocked and mountainous, Kyrgyzstan is bordered by Kazakhstan to the north, Uzbekistan to the west, Tajikistan to the southwest and China to the east. 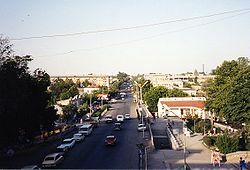 Its capital and largest city is Bishkek. Kyrgyzstan is officially a democratic parliamentary republic. A revolution in April 2010 overthrew the former president Kurmanbek Bakiyev and resulted in the adoption of a new constitution and the appointment of an interim government. Presidential elections were held in November 2011. 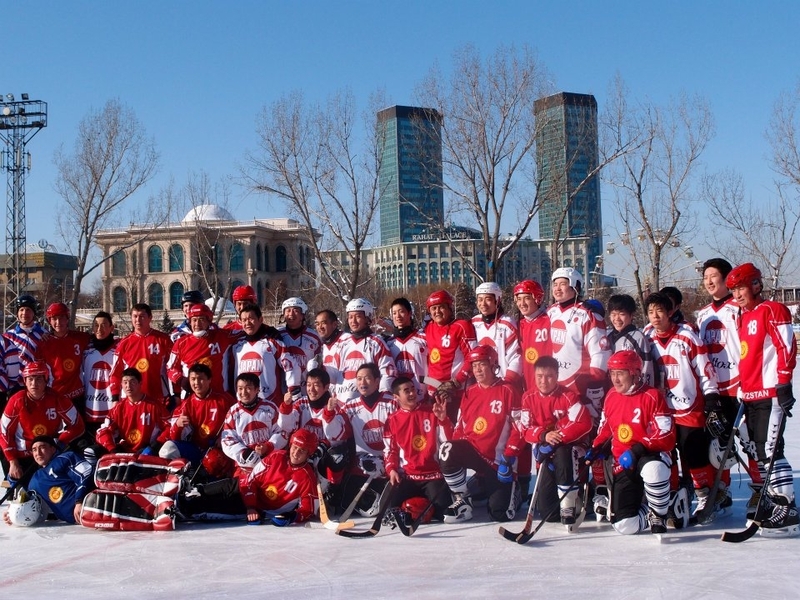 Kyrgyzstan is one of the active members of the Turkic Council and the TÜRKSOY community. The national language, Kyrgyz, is also closely related to the other Turkic languages, with which it shares strong cultural and historical ties. Additionally, Kyrgyzstan is a member of the Commonwealth of Independent States, the Eurasian Economic Community, the Non-aligned movement and the Organisation of Islamic Cooperation. 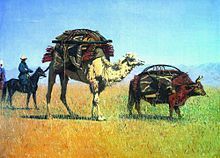 As early as the 7th century, Turkic traders introduced Islam to Central Asia, including what is now Kyrgyzstan, through doing business with Arabic people. The Kyrgyz state reached its greatest expansion after, under the leadership of Jordan the Superior, defeating the Uyghur Khanate in 840 A.D. Then the Kyrgyz quickly moved as far as the Tian Shan range and maintained their dominance over this territory for about 200 years. In the twelfth century, however, the Kyrgyz dominion had shrunk to the Altay Range and Sayan Mountains as a result of the Mongol expansion. With the rise of the Mongol Empire in the thirteenth century, the Kyrgyz migrated south. The Kyrgyz were conquered by Genghis Khan in 1207. 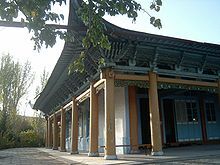 Chinese and Muslim sources of the 7th–12th centuries AD describe the early Kyrgyz as red-haired with white skin and blue eyes, which is indicative of ancient Iranic mountain tribes like the Pamiri people or Dardic people. The descent of the Kyrgyz from the autochthonous Siberian population is confirmed on the other hand by the recent genetic studies. Because of the processes of migration, conquest, intermarriage, and assimilation, many of the Kyrgyz peoples that now inhabit Central and Southwest Asia are of mixed origins, often stemming from fragments of many different tribes, though they now speak closely related languages. Issyk Kul Lake was a stopover on the Silk Road, a land route for traders, merchants and other travelers from the Far East to Europe. Many historians believe that the lake was the point of origin for the Black Death that plagued Europe and Asia during the early and mid-14th century. In June 1990, ethnic tensions between Uzbeks and Kyrgyz surfaced in Osh Oblast (southern Kyrgyzstan), where Uzbeks form a majority of the population. Attempts to appropriate Uzbek collective farms for housing development triggered the Osh Riots. A state of emergency and curfew were introduced and Askar Akayev, the youngest of five sons born into a family of collective farm workers (in northern Kyrgyzstan), was elected President in October of that same year. In October 1991, Akayev ran unopposed and was elected president of the new independent Republic by direct ballot, receiving 95% of the votes cast. Together with the representatives of seven other Republics that same month, he signed the Treaty of the New Economic Community. Finally, on 21 December 1991, Kyrgyzstan joined with the other four Central Asian Republics to formally enter the new Commonwealth of Independent States. Kyrgyzstan gained full independence a few days later on 25 December 1991. The following day, 26 December 1991, the Soviet Union ceased to exist. In 1992, Kyrgyzstan joined the United Nations and the Organization for Security and Co-operation in Europe (OSCE). On 5 May 1993, the "Republic of Kyrgyzstan" was renamed the "Kyrgyz Republic". Political stability appeared to be elusive, however, as various groups and factions allegedly linked to organized crime jockeyed for power. Three of the 75 members of Parliament elected in March 2005 were assassinated, and another member was assassinated on 10 May 2006 shortly after winning his murdered brother's seat in a by-election. All four are reputed to have been directly involved in major illegal business ventures. thumb|right|250px|Ethnolinguistic map of Central Asia in 1992 Current concerns[when?] in Kyrgyzstan include privatisation of state-owned enterprises, expansion of Western influence, inter-ethnic relations and terrorism. On 6 April 2010, civil unrest broke out in the town of Talas, spreading to the capital Bishkek by the following day. Protesters attacked President Kurmanbek Bakiyev's offices, as well as state-run radio and television stations. As a result, Bakiyev declared a state of emergency. Reports say that at least 80 people died as a result of clashes with police. A transition government, led by former foreign minister Roza Otunbayeva, by 8 April 2010 had taken control of state media and government facilities in the capital, but Bakiyev had not resigned from office. President Kurmanbek Bakiyev returned to his home in Jalal-Abad and stated his terms of resignation at a 13 April 2010 press conference. On 15 April 2010, Bakiyev left the country and flew to neighboring Kazakhstan, along with his wife and two children. The country's provisional leaders announced that Bakiyev signed a formal letter of resignation prior to his departure. On 6 April 2010, a demonstration in Talas protested against government corruption and increased living expenses. The protests turned violent and spread nationwide. There were conflicting reports that Interior Minister Moldomusa Kongatiyev had been beaten. On 7 April 2010, Kyrgyz President Kurmanbek Bakiyev imposed a state of emergency. Police and special services arrested many opposition leaders. 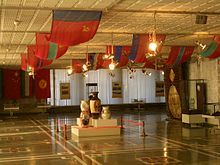 In response, protesters took control of the internal security headquarters (former KGB headquarters) and a state television channel in the capital, Bishkek. [ត្រូវការអំណះអំណាង] Reports by Kyrgyzstan government officials indicated that at least 75 people were killed and 458 hospitalized in bloody clashes with police in the capital. Prime Minister Daniar Usenov accused Russia of supporting the protests; this accusation was denied by Russian Prime Minister, Vladimir Putin. Opposition members also called for the closing of the US controlled Manas Air Base. On 15 April 2010, Bakiyev left the country and flew to neighboring Kazakhstan, along with his wife and two children. The country's provisional leaders announced that Bakiyev signed a formal letter of resignation prior to his departure. Russia's President Dmitry Medvedev ordered measures to ensure the safety of Russian nationals and tighten security around Russian sites in Kyrgyzstan to protect them against possible attacks. Finding it difficult to control the situation, Roza Otunbayeva, the interim leader, sent a letter to Russian president Dimitry Medvedev asking him to send Russian troops to help the country control the situation. Medvedev's Press Attaché, Natalya Timakova, said in a reply to the letter, "It is an internal conflict and for now Russia does not see the conditions for taking part in its resolution". The clashes caused a shortage of food and other essential commodities with more than 200 killed and 1,685 people hurt, កាលពី 12 មិថុនា 2010 (2010 -06-12)[update]. The Russian government, however, said it would be sending humanitarian aid to the troubled nation. Ethnic fighting continued into a third day as armed groups, mainly Kyrgyz, continued to threaten local Uzbeks. By 13 June 2010, the unrest had claimed about 100 lives, while the number injured had increased to over 1,000. The riots spread to neighboring areas, and the government declared a state of emergency in the entire southern Jalal-Abad region. To control the situation, the interim government gave special shoot-to-kill powers to the security forces. The Russian government decided to send a battalion to the country to protect Russian facilities. The interim president, Roza Otunbayeva, accused the family of ousted president Kurmanbek Bakiyev of "instigating the riots". AFP reported "a veil of smoke covering the whole city". Authorities in neighboring Uzbekistan said at least 30,000 Uzbeks had crossed the border to escape the riots. Osh became relatively calm on the 14 June 2010, but Jalal-Abad witnessed sporadic incidents of arson. The interim government accepted that the security situation was worsening nearing Jalal-Abad. [ត្រូវការបញ្ជាក់] The entire region was still under a state of emergency as Uzbeks were reluctant to leave their houses for fear of attacks by the mobs. The United Nations decided to send an envoy to assess the situation. Temir Sariyev, deputy chief of the interim government, said there were local clashes and that it was not possible [for the government] to fully control the situation. He added that there were not sufficient security forces to contain the violence. 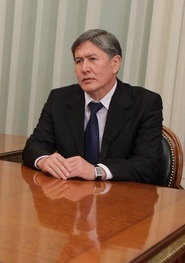 Media agencies reported on 14 June 2010 that the Russian government was considering a request by the Kyrgyz government. An emergency meeting of Collective Security Treaty Organisation (CSTO) was held on the same day (14 June) to discuss the role it could play in helping to end the violence. The deputy head of Uzbekistan's emergency services, Riza Ibragimov, confirmed the presence of more than 60,000 Uzbek refugees in Andijan Province. Ethnic violence waned, according to the Kyrgyz government, by 15 June 2010 and Kyrgyz president Roza Otunbayeva held a news conference on Tuesday (15 June 2010) and declared that there was no need for Russia to send in troops to quell the violence. There were at least 170 people left dead by 15 June 2010 but Pascale Meige Wagner of the International Committee of the Red Cross said the [official] death toll was an underestimate. The UN High Commissioner told reporters in Geneva that evidence suggested that the violence seemed to have been staged up. The United Nations called for a "humanitarian corridor" to be set up to help the people affected by the riots and described the situation as a "tinder-box". There were fears that a referendum, which would pave the way for parliamentary style elections in October 2010, would be delayed but the Kyrgyz president calmed such fears by declaring that the referendum would be held as scheduled. There were no reports of heavy fighting between the Kyrgyz and the Uzbeks on 16 June 2010 and UN airplanes with tents and other emergency aid started arriving in neighboring Uzbekistan. Russian government cargo airplanes carrying food and blankets also landed in Bishkek. According to the World Food Programme, it had enough food in Kyrgyzstan to feed 87,000 people for two months. The clashes left some 300,000 people internally displaced and Uzbek leaders wanted the UN peacekeeping force to intervene because they did not trust the Kyrgyz forces any longer. Another 100,000 refugees crossed the border into Uzbekistan. Ethnic Uzbeks threatened to blow up an oil depot in Osh if they failed to get guarantees of protection. The United Nations said it believed that the attacks were "orchestrated, targeted and well-planned". Kyrgyz officials told the media that a person suspected to be behind the violence in Jalal-Abad had been detained. The commission's preliminary report will be sent by 10 September 2010 to President Roza Otunbayeva, who had said that an international commission would also be formed to investigate the clashes. In the aftermath of the turmoil, on 5 August 2010, Kyrgyz forces arrested party leader Urmat Baryktabasov on suspicion of plotting an overthrow of the government, after troops allegedly fired blank rounds into a crowd trying to join mass demonstrations near the Parliament in the capital Bishkek. Acting President Roza Otunbayeva said security forces seized firearms and grenades from him and 26 supporters. The 1993 constitution defines the form of government as a democratic republic. The executive branch includes a president and prime minister. The parliament currently is unicameral. The judicial branch comprises a Supreme Court, local courts and a Chief Prosecutor. The amendments to the constitution approved by the referendum resulted in stronger control by the president and weakened the parliament and the Constitutional Court. Parliamentary elections for a new, 75-seat unicameral legislature were held on 27 February and 13 March 2005, but were widely viewed as corrupt. 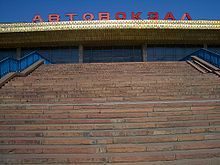 The subsequent protests led to a bloodless coup on 24 March 2005, after which Akayev fled the country and was replaced by acting president Kurmanbek Bakiyev (see: Tulip Revolution). In a move that alarmed human rights groups, dozens of prominent Uzbek religious and community leaders were arrested by security forces following the 2010 South Kyrgyzstan riots, including journalist and human rights activist Azimzhan Askarov. Kyrgyzstan is a landlocked country in Central Asia, bordering Kazakhstan, China, Tajikistan and Uzbekistan. It lies between latitudes 39° and 44° N, and longitudes 69° and 81° E. It is farther from an ocean than any other country in the world although it does not contain the absolute farthest point from any ocean. That spot lies in the Xinjiang region of Northwestern China. The mountainous region of the Tian Shan covers over 80% of the country (Kyrgyzstan is occasionally referred to as "the Switzerland of Central Asia", as a result), with the remainder made up of valleys and basins. 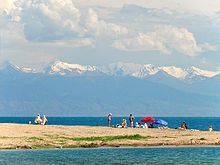 Issyk-Kul Lake in the north-eastern Tian Shan is the largest lake in Kyrgyzstan and the second largest mountain lake in the world after Titicaca. The highest peaks are in the Kakshaal-Too range, forming the Chinese border. Peak Jengish Chokusu, at ៧៤៣៩ ម (២៤៤០៦ ភត), is the highest point and is considered by geologists to be the northernmost peak over ៧០០០ ម (២២៩៦៦ ភត) in the world. Heavy snowfall in winter leads to spring floods which often cause serious damage downstream. The runoff from the mountains is also used for hydro-electricity. The confluence forms the Syr Darya, which originally flowed into the Aral Sea. កាលពី 2010[update], it no longer reaches the sea, as its water is withdrawn upstream to irrigate cotton fields in Tajikistan, Uzbekistan, and southern Kazakhstan. The Chu River also briefly flows through Kyrgyzstan before entering Kazakhstan. The climate varies regionally. 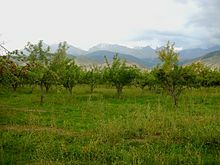 The south-western Fergana Valley is subtropical and extremely hot in summer, with temperatures reaching ៤០ °C (១០៤ °F) The northern foothills are temperate and the Tian Shan varies from dry continental to polar climate, depending on elevation. In the coldest areas temperatures are sub-zero for around 40 days in winter, and even some desert areas experience constant snowfall in this period. There is one exclave, the tiny village of Barak (population 627), in the Fergana Valley. The village is surrounded by Uzbek territory. It is located on the road from Osh (Kyrgyzstan) to Khodjaabad (Uzbekistan) about 4 km north-west from the Kyrgyz–Uzbek border in the direction of Andijan. Barak is administratively part of Kara-Suu District in Kyrgyzstan's Osh Province. There are four Uzbek enclaves within Kyrgyzstan. Two of them are the towns of Sokh (area ៣២៥ គ.ម២ (១២៥ ម៉ាយ ក.) and a population of 42,800 in 1993, although some estimates go as high as 70,000; 99% are Tajiks, the remainder Uzbeks) and Shakhimardan (also known as Shahimardan, Shohimardon, or Shah-i-Mardan, area ៩០ គ.ម២ (៣៥ ម៉ាយ ក.) and a population of 5,100 in 1993; 91% are Uzbeks, the remainder Kyrgyz); the other two are the tiny territories of Chong-Kara (roughly 3 km long by 1 km wide or 2 mi by 0.6 mi) and Jangy-ayyl (a dot of land barely 2 or 3 km across). Chong-Kara is on the Sokh river, between the Uzbek border and the Sokh enclave. Jangy-ayyl is about ៦០ សហាតិមាត្រ (៣៧ ម៉ៃ.) east of Batken, in a northward projection of the Kyrgyz-Uzbek border near Khalmion. There also are two enclaves belonging to Tajikistan: Vorukh (exclave area between 95–130 គ.ម២ (៣៧–៥០ ម៉ាយ ក. ), population estimated between 23,000 and 29,000, 95% Tajiks and 5% Kyrgyz, distributed among 17 villages), located ៤៥ សហាតិមាត្រ (២៨ ម៉ៃ.) south of Isfara on the right bank of the Karafshin river, and a small settlement near the Kyrgyz railway station of Kairagach. 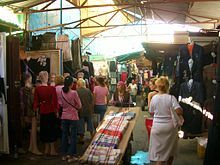 Kyrgyzstan was the second poorest country in the former Soviet Union, and is today the second poorest country in Central Asia. According to CIA World Factbook, in 2011, a third of the country's population lived below the poverty line. 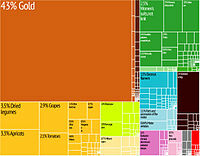 Graphical depiction of Kyrgyzstan 's product exports in 28 color coded categories. The principal exports are nonferrous metals and minerals, woolen goods and other agricultural products, electric energy and certain engineering goods. Imports include petroleum and natural gas, ferrous metals, chemicals, most machinery, wood and paper products, some foods and some construction materials. Its leading trade partners include Germany, Russia, China, Kazakhstan, and Uzbekistan. Kyrgyzstan's population is estimated at 5.2 million in 2007. Of those, 34.4% are under the age of 15 and 6.2% are over 65. The country is rural: only about one-third of population live in urban areas. The average population density is 25 people per km². The nation's largest ethnic group are the Kyrgyz, a Turkic people, who comprise 69% of the population (2007 estimate). Other ethnic groups include Russians (9.0%) concentrated in the north and Uzbeks (14.5%) living in the south. Small but noticeable minorities include Dungans (1.9%), Uyghurs (1.1%), Tajiks (1.1%), Kazakhs (0.7%), and Ukrainians (0.5%) and other smaller ethnic minorities (1.7%). Kyrgyzstan has over 80 distinct ethnic groups in the country. 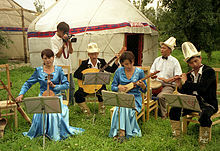 Kyrgyz is a member of the Turkic group of languages and was written in the Arabic alphabet until the twentieth century. Latin script was introduced and adopted in 1928, and was subsequently replaced by Cyrillic script in 1941. Generally, people understand and speak Russian all over the country, except for some remote mountain areas. [ត្រូវការអំណះអំណាង] Russian is the mother tongue of the majority of Bishkek dwellers, and most business and political affairs are carried out in this language. Until recently, Kyrgyz remained a language spoken at home and was rarely used during meetings or other events. However, most parliamentary meetings today are conducted in Kyrgyz, with simultaneous interpretation available for those not speaking Kyrgyz. In addition to celebrating the New Year each January 1, Kyrgyz observe the traditional New Year festival Nowruz on the vernal equinox. 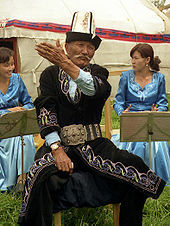 This spring holiday is celebrated with feasts and festivities such as the horse game Ulak Tartish. Islam is the dominant religion of Kyrgyzstan: 80% of the population is Muslim while 17% follow Russian Orthodoxy and 3% other religions. A 2009 Pew Research Center report indicates a higher percentage of Muslims, with 86.3% of Kyrgyzstan's population adhering to Islam. 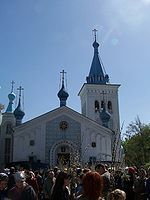 The other faiths practiced in Kyrgyzstan include Russian Orthodox and Ukrainian Orthodox[disambiguation needed] versions of Christianity, practiced primarily by Russians and Ukrainians respectively. A small minority of ethnic Germans are also Christian, mostly Lutheran and Anabaptist as well as a Roman Catholic community of approximately 600. For those interested in trekking and camping, every region offers attractions and challenges. Some of the most popular locations for camping are southern Osh, the area between Naryn City and the Torugart pass, and the mountains and glaciers surrounding Karakol in Issyk-Kul. [ត្រូវការអំណះអំណាង] Local guides and porters can be hired from many tour companies in Bishkek and in the provincial capitals. Skiing is still in its infancy as a tourism industry, but there is one fairly cheap and well-equipped base about a half-hour from Bishkek. The ski base of Toguz Bulak is 45 km from Bishkek, on the way to Issyk Ata valley. In the Karakol Valley National Park, outside Karakol, there is also a ski base with three T-bars and rental equipment available of good quality. The school system in Kyrgyzstan includes primary (grades 1 to 4) and secondary (grades 5 to 11 (or sometimes 12)) divisions within one school. Children are usually accepted to primary schools at the age of 7. It is required that every child finishes 9 grades of school and receives a certificate of completion. Grades 10-11 are optional, but it is necessary to complete them to graduate and receive a state-accredited school diploma. To graduate, a student must complete the 11-year school course and pass 4 mandatory state exams in writing, maths, history and a foreign language. 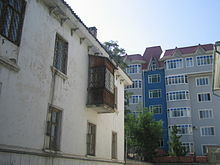 There are 77 public schools in Bishkek (capitol) and more than 200 in the rest of the country. There are 55 higher educational institutions and universities in Kyrgyzstan, out of which 37 are state institutions. Transport in Kyrgyzstan is severely constrained by the country's alpine topography. Roads have to snake up steep valleys, cross passes of ៣០០០ មាត្រ (៩៨០០ ភត) altitude and more, and are subject to frequent mud slides and snow avalanches. Winter travel is close to impossible in many of the more remote and high-altitude regions. Jalal-Abad Airport is linked to Bishkek by daily flights. The national flag carrier, Kyrgyzstan, operates flights on An-24 aircraft. During the summer months, a weekly flight links Jalal-Abad with the Issyk-Kul Region. The Chuy Valley in the north and the Ferghana valley in the south were endpoints of the Soviet Union's rail system in Central Asia. Following the emergence of independent post-Soviet states, the rail lines which were built without regard for administrative boundaries have been cut by borders, and traffic is therefore severely curtailed. The small bits of rail lines within Kyrgyzstan, about 370 km (1,520 mm broad gauge) in total, have little economic value in the absence of the former bulk traffic over long distances to and from such centres as Tashkent, Almaty, and the cities of Russia. A road in Osh, the second largest city in Kyrgyzstan. ↑ "Constitution"។ Government of Kyrgyzstan។ http://eng.gov.kg/index.php?option=com_content&task=view&id=20&Itemid=47។ បានយកមក 2009-09-23។ "
↑ "Ethnic Uzbeks in Kyrgyzstan Voice Complaints Over Discrimination, Corruption". EurasiaNet.org. January 24, 2006. ↑ "Signs of Uzbek Persecution Rising in Kyrgyzstan"
↑ "Kyrgyz Commission Begins Investigating Ethnic Clashes"
↑ "Attempted coup rocks tense Kyrgyzstan"
↑ CIA World Factbook. "Percentage of population below the poverty line by country"